Because dirt and dust often goes unnoticed on windows, mirrors and other types of glass surfaces, they become very dirty and dusty overtime. Although many assume areas don’t hold dirt if their not touched or used, things like heating and air conditioning, static and other environmental factors can affect glass surfaces. Cleaning staff or contractors generally only cleans smudges and fingerprints during their cleaning schedule. When it’s time to clean the windows, mirrors and glass surfaces thoroughly, it requires a little extra work to get the job done properly with ease. If the facility has many glass surfaces, windows and mirrors, attempt to spread the work out overtime. Window, especially those indoors and in entrance ways, typically are framed or encased using metal or wood as ledges for its appearance or security purposes. In many cases, those areas are dusted on a routine basis, but clean them thoroughly when you aggressively clean the windows. Dusting those areas doesn’t pick up dirt that builds up overtime, especially in entrance ways. You can use any type of properly diluted all purpose cleaner and a rag to clean them. You won’t have to be careful not to touch the glass with the cleaner if you do this before you start the process of cleaning the glass. Like every other surface, dirt and dust can build up on surfaces such as windows. To make the job easier or using excessive window cleaner, start by cleaning the windows with a special solution. Mix dish detergent with warm mater. It can be diluted less than the amount used to do dishes. Use a product such as Worldwide Janitor’s Almond Ease Dishwash. Not only is it an excellent product, it’s concentrated and only requires 4 oz. per 10 gallons, making it economical. Mix about ½ the recommended amount of dish detergent and add about a gallon of warm water in a pail or bucket. Saturate a microfiber cloth or lint-free rag in the mixture and ring it out. Because many people use lotion on their hands, the dish detergent mixture will help remove fingerprints and other substances that may require more work because of the oils on the fingerprints and smudges. Dish detergent is formulated to remove grease and will make your job easier. Using the rag, wipe the entire glass surface with the mixture to remove dirt and dust starting at the top of the window and working your way down. Use a squeegee to remove the solution. The surface may look streaked. Use a ladder to clean the entire surface if necessary. You can also use a telescopic handle to reach high windows with a window washer sleeve or bug squeegee to avoid getting on a ladder. Wordwide Janitor has telescopic handles in lengths of up to 24 feet. In a second pail or bucket, dilute window cleaner and water as directed by the manufacturer. Worldwide Janitor carries a variety of window cleaners, including the Streak Free Non-Ammoniated Window Cleaner, which is biodegradable. After diluting the window cleaner according to manufacturer’s instructions, pour it into a spray bottle. Spray the glass surface and use a squeegee to remove the cleaner. The Streak-Free Window Cleaner can also work on a variety of other surfaces such as bath fixtures and countertops. It can be used for multiple applications that require a shiny, streak-free appearance. Aggressive window cleaning can be a big job and there may be a spot here or there that needs that was missed. Check the windows within most people’s line of vision, preferably when the sun is shining on the glass, because those spots are much more visible in bright light. Use a paper towel and streak-free window cleaner to clean those spots. The results leave your windows, mirrors and other glass surfaces clean with an incredible shine. It also helps eliminate musty odors from the buildup of dirt and dust on the windows. To keep glass looking clean, use a streak-free window cleaner and squeegee on glass surfaces on a routine or rotating basis so you don’t have to aggressively clean windows again. 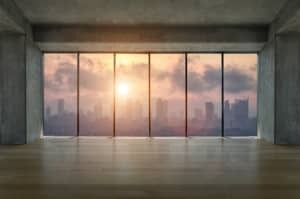 Because it can be a big job in facilities that have many indoor windows, allow the facility contact person see the amount of debris that collects on those surfaces. If you’re a cleaning contractor, suggest doing the windows for an additional fee if it’s not in your cleaning contract. If the facility has its own cleaning staff, suggest doing the job by concentrating on one area at a time so it doesn’t interfere with their regular cleaning schedule and offer overtime if it requires interfering with the staff’s regular cleaning schedule. This entry was posted in Dust Control, FAQ's, General Cleaning, Janitorial and tagged almond ease dishwash, Bug Squeegee, Streak Free Non-Ammoniated Window Cleaner, telescopic handles. Bookmark the permalink.